Perhaps because Jean-François Lyotard was a prolific and sometimes too hasty writer (as he termed himself), the reader is a witness to the development of the philosopher over time. Discours, figure was translated into English decades after its publication in French and was known to English readers only through commentary or the occasional translated bits and pieces. Despite its comparatively early date of publication, 1971, Discours, figure was not an immature work but a marker on the way to Lyotard’s own position in philosophy. In its own fashion, Discours, figure inaugurates or illustrates his incorporation of received and traditional ideas in Modernist philosophy but through critiquing the ideas of Ferdinand de Saussure (1857-1913) and Maurice Merleau-Ponty (1908-1961), he adapts well-understood concepts of language and phenomenology for his own ends. The complexity of Lyotard’s pharasing with its words taken at face value (all their possible meanings layered one on top of the other) and neologisms (dé-jeu) is indicative not only of the often perilous task that awaits any translator of Lyotard’s writing, but also of the ambiguity Lyotard invests in the proper pronoun (s’attendre as waiting for each other/oneself”) and thus of the care he takes in foiling (déjouer) the grasp of the philosopher, the historian and the biographer-critic. This evasion is playful, no doubt, but also deadly serious: un-game, dé-jeu. The solution Lyotard proposes to translate this elusive strategy is to translate the verb s’attendre in the language in which it is written or writes iself—whatever language presumably this may be. So one approaches this notorious book, not translated until 2011 and considered essentially untranslatable by one of its translators, Lydon, who worked in the translation for twenty five years, with caution. Just as another of his earlier works, Libidinal Economy (1974), came out of his time as a student of Jacques Lacan, Discours, figure was a product of Structuralism and its end at the hands of Deconstruction, a reiteration of Freud through the lingering ghost of Lacan and the always present political implications of Marxism. Considered one of his four “books” by Lyotard, Discours, figure also reflects the investigation into phenomenology of his first book, Phenomenology (1954) and laces psychoanalytical theory into its pages. As in all of Lyotard’s books, there are digressions and wanderings, thick layered footnotes, and what his translators termed a deliberate “elusiveness” as to a topic or a thesis or a goal. The publication of the book, 1971, was significant in that it followed the impact of Jacques Derrida’s Deconstruction upon the literary and philosophical scene. Wending his way through Saussure and Merleau-Ponty to get to Derrida, Lyotard arrived at his own version of language and its discontents. Discours, figure is all about the comma that divides the two words, inserting an element of incommensurability that sought to insinuate a diminutive radicality that allowed for the entry of an alien term, “figure,” into the warp and woof of “discourse.” Discourse is a conceptual view of language which flattens language into a system of pure oppositions, but the Figure is corporeal, connected to the eye which is never civilized and always mobile and is inevitably repressed by linguistics. This book takes the side of the eye, of its sitting; shadow is its prey. The half-light that, after Plato, the word threw like a gray pall over the sensory that it consistently thematize as a a lesser being, whose side has been very rarely taken, taken untruth, since it was understood that its side is that of falsity, skepticism, the rhetorician, the painter, the condottiere, the libertine, the materialist—this half light is precisely what interests this book. Readers of Lyotard’s later works, “books” or not, will recognize the seeds of these texts which crop up in Discours, figure. Discourse is representation by concepts that organize the object of knowledge as a system or units of meaning. These meanings are defined in terms of their positions in that particular discursive network. In other words, that discourse imposes what should be/can be thought or spoken by way of spatial arrangements. The resulting net(work) imposes itself upon objects that are rendered textual and lie down in opposition to one another. Lyotard envisioned this space as flat, like a table, where language and its grids could be conveniently laid out for all to see. Upon this (flat) “space” of arrangements, various texts coalesce into a “discourse,” or that which can be articulated, called the “discursivization of textual space.” In other words, signifiers morph into discourse and signifieds or meaning is produced by the oppositional play between signifiers. 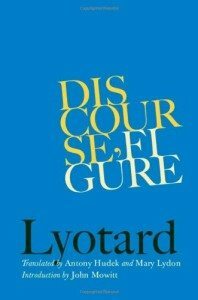 For those familiar with Saussure’s Structuralism, Lyotard’s discussion is a familiar one, but he rejected the homogeneity of the discursive space asserted to be as purely textual and placed himself firmly in the Post-Structuralist camp by introducing the Figure into the undifferentiated space of Discourse. Although his insistence upon the alien and unwelcome Figure is akin to Deconstruction, Lyotard’s critique of both Saussure and Derrida was that both philosophers confined themselves to the “text” or that which was constructed through representational concepts. 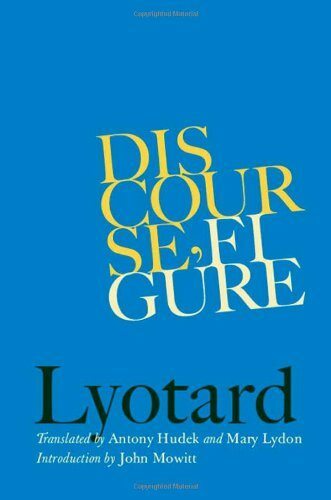 Famously Derrida asserted “There is no outside the text,” (“il n’ya pas de hors texte”) but Lyotard begged to differ. The task of discourse is to represent, and, in taking up that task, language tautologically assumes that representation is possible. This assumption of control over language is linked historically to the invention of perspective in the Renaissance, a visual system of lines that “represented” space. But in order for language to represent, heterogeneous elements, such as the Figure or the Figural, had to be suppressed, written out of language, as it were. It is important to note that both Saussure and Derrida conceived of language as a flat depthless site in which the signs were totally unmotivated or lying in arbitrary oppositions, activated only by or within the network of relationships. Lyotard was not so much asserting depth onto a spaceless plane nor was he inserting a materiality as he was introducing a form of thinking that was linked to seeing or the visible. The Figure lies just outside of language, at its periphery, on its edge, invading its well planned system and inserting itself without being acknowledged. The Figural cannot be acknowledged because it invokes that which cannot be represented. In its (non)function of designating or in its role in pointing to, the Figure can be linked to the “here” as opposed to the “there” as the finger points and the eye follows. In formal language “here,” “there,” “this,” “that,” “now,” “then,” and so on are designators and are, in linguistic terms, so vague and imprecise that they are useless as representations. That said, these physical and linguistic gestures refer to sensory and/or temporal conditions that are outside the discursive but are necessary to speech and writing or what Lyotard referred to as expression. One would be more inclined to back André Leroi-Gourhan’s well-argued hypothesis, according to which the oldest language performed a sacred function and the first significative spoken units were uttered by a narrator who simultaneously gestured toward the corresponding painted figures during ceremonial processions followed by the robe in temple-caverns. The hypothesis is very appealing since the function of designation immediately comes across in all its power and specificity. The latter hinges on two decisive points: speech is not uttered in the absence of the designated thing, but in its presence; and the designated thing is not a thing but a symbol which legitimately can be said from the outset to be opaque. Therefore, it is this expressiveness, this pointing function of figuration–the sayer of the word pointing to (the picture of/the sign for) the thing that consists of the depth or the “thickness,” as Lyotard would have it, in the language. Rhetoric, then, partakes of the Figure in that, like the hand of the narrator, rhetoric gestures to that which is beyond uttering, that which escapes discourse or representation through concepts. The philosopher set aside linguistic models based on firmly opposed opposites and insisted upon the simultaneous presence of heterogeneity due presence of the (suppressed) other haunting the textual. As the example of the cave paintings suggested, vision is a necessary element of speaking and the glue of concepts and this physicality of language cannot be reduced to phenomenology, which seeks an impossible “pure” pre-cognitive vision untouched by words. To envision, so to speak, the points that Lyotard was making, one would do no better than to return to Stéphane Mallarmé’s Un Coup de Dés Jamais N’Abolira Le Hasard (1897, published as a book in 1914). Lyotard lauds the poem’s “power to figure.” Mallarmé’s contribution was to call attention of the physicality of the marks on the page and to the visuality of the poem which rolls and bounds from page to page, shedding, in its exuberance, one font and trying on another, leaving gaps and spaces which assert themselves in a graphic negation. Here, on the white pages, the figural emerged to confront the reader with the dark ink forming physical lines that run erratically, like a tossed die, against the winds of chance. The figural is never discourse’s Other but always its ghost, vision separated from concept by a mere comma. Discourse/figure is incommensurable in spatial terms and constitute a co-present of heterogeneous spaces, an informal mode of art work’s presentation of itself as is seen (literally) in the thick and materiality of Mallarmé’s poem. Lyotard referred to the intrusion of the figural as an intrusion of the “rhetorical” or that which discourse considers to be excessive and is incommensurable with discursive representation. There is something other than representation that cannot be contained by nor captured by discursive concepts. This something other, for Barthes, was “style”, for Lyotard it was “figure.” The second part of the discussion of Discourse, Figure will take up the role of art as the Figural.